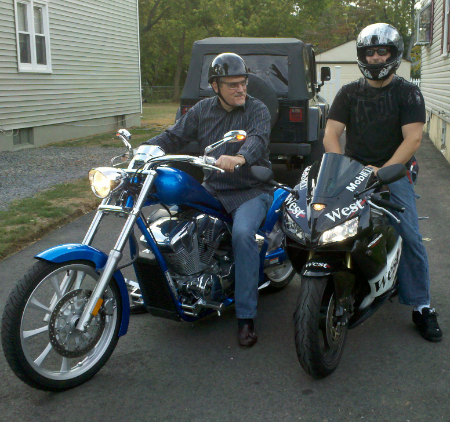 What a great day for a ride north to new territory in Freehold, New Jersey. We mustered 15 bikes and 2 cages giving us around 20 people to welcome home SrAirman David-John Leventhal from duty with the 447th EOD Flight at Sather Air Base Bagdad, Iraq. We had the Warriors Watch Riders, Riders of the Lamb and Goldwing Riders from Chapter F (F-troop) ready to give DJ that Rock Star treatment. The Freehold PD were on hand and did a super job providing safe passage to our heroes home and then to the final destination. DJ came out of his front door, and so did his neighbors, when we pulled up letting him know we were there like we know best, lots of noise! We all said our Hello’s then DJ and his dad rolled out there bikes to fall in with us and roll to a dinner in DJ’s honor about a dozen miles away. It was a great ride with Freehold PD holding back the traffic. Upon arrival at the restaurant we dismounted, asked DJ to say a few words and finished with a mug and hug after a prayer from Pastor Paul on this 9/11. David-John Leventhal, Thank You for your service and welcome home. No user commented in " "